Any visit to Portland can seem intimidating, especially if you’re wanting to cover as much ground as possible, but are just passing through for a quick visit. No matter your tastes in fermented beverages, you’ll find something delicious, all within walking distance, in SE Portland. Back when I first moved here 8 years ago, the best places to take out of towners were Deschutes and Rogue in the Pearl, or Hopworks down on Powell. Today, you can spend a few hours or even a full day exploring the SE Portland neighborhood of Buckman, all on foot, and be able to sample some of the best things on tap anywhere. Within a square mile, you’ll find 7 Brewpubs including the hottest brewery on the West Coast, the largest cider taproom in the US, the House of Sour, a gluten free brewery, and a total of over 340 taps. Here’s a breakdown of where to go and what to get when you’re there. One of Portland’s oldest and most revered breweries, Hair of the Dog offers a full lunch and dinner menu. They feature 10 beers on tap, predominantly dark, Belgian inspired strong ales, plus an additional ~16 bottles for on-site consumption. When a fellow beer writer or beer nerd comes to town, they generally want to come here, so it has that kind of reputation. Best For? Serious beer nerds and visitors from Europe? 0.4 mile, 10 minute walk to Loyal Legion. Portland’s largest beer hall, Loyal Legion offers “99 Oregon-only taps” including a wealth of IPAs, Lagers, Stouts, Sours, Ciders and just about every style you can imagine. They also offer a wide variety of fine whiskeys, all in one of the coolest spaces in town. They regularly host beer release and tap-takeover events and offer a tasty assortment of food including burgers, sausages and more. Best For? Anyone who’s short on time and wants to try all they can at one place. 0.2 mile, 3 minute walk to Modern Times Belmont Fermentorium. As I’ve detailed before, the new Belmont Fermentorium has become one of the most popular and regularly filled brewpubs in Portland. Sporting 25 taps, now mostly pouring PDX brewed batches, this funky space regularly updates their taps with their much heralded Hazy IPAs, Fruited Sours and Imperial Stouts. You’ll also find a limited food menu (Vegan food only), plenty of canned 4 packs on sale, merch and a continuing expansion over the next 16 months. Yes, it’s a bit pricier than most places in town, but the quality of their cutting edge brews are second to none today. Best For? Beer nerds and adventurous palates. 0.1 mile, 2 min walk to Growler Guys. While Growler Guys is technically a chain, their 7 locations throughout Oregon are an excellent model for offering a great variety for growler and crowler fills. This location, effectively the epicenter of this SE tour, offers 50 taps of predominantly Oregon and Washington beers and ciders. The taps are generally arranged from lightest to darkest, with virtual taphandles on their electronic menu. I love the little taster glasses you can keep filling until you find the one you fancy. Best For? Tourists, a mellow environment to sample, crowler fills. 0.1 mile, 2 minute walk to Cascade Barrel House. Home to Portland’s House of Sour, Cascade Brewing has established themselves as one of the finest purveyors of sours ales in the world. Unbounded by style guidelines, their 24 constantly rotating taps are predominantly inhabited by barrel-aged wild and sour ales. While their food menu is a bit more limited than it once was, there are plenty of other food options in the neighborhood. If you can swing it, stop by for Tap it Tuesday, their weekly tapping of a live barrel or sign up with a friend to tap it with! Best For? Sour heads, may not be for casual beer drinkers. 0.1 mile, 2 min walk to Rogue Eastside Pub & Pilot Brewery. Just across the street from Cascade lies a recently renovated space known for having quite a taplist. 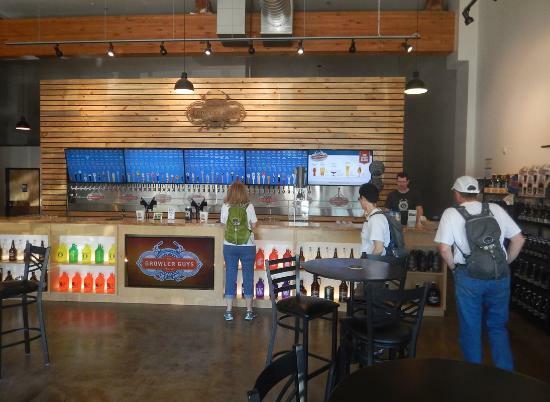 Previously known as The Green Dragon, and still home to Oregon’s oldest homebrew club, the Oregon Brew Crew, this 55 tap brewpub is now owned and operated by Rogue Ales. The vibe here has changed a bit since the makeover, yet there’s quite a variety available on tap and a pub grub style menu. Best For? Casual beer drinkers, and weekend party people. 0.1 mile, 2 min walk to Schilling Cider House. Just blocks from Rogue you’ll find this brand new 50 tap cider house, featuring 9 taps of Schilling Ciders. One of the centerpieces of the new Goat Hill blocks complex, the space overlooks the entire stretch of ground covered thus far and is a great spot to take in a sunset. They too offer a limited food menu and tons of space for seating inside, not to mention a firepit on the deck. Best For? The gluten intolerant and wine drinkers. 0.7 miles or 15 minutes to Ground Breaker Brewing and Gastropub. Last, but certainly not least, is Portland’s award winning 100% gluten free brewery, Ground Breaker. Utilizing roasted chestnuts, organic lentils, sorghum and hops, they’ve managed to win 3 GABF gold medals for their Dark Ale and one each for their IPA and Pale Ale. With 9 taps available and a wide variety of gluten-free eats, this is a one-of-a-kind experience not to be missed. Best For? The gluten intolerant and those seeking a break from the norm. Between all these locations are even more bars, great spots to eat, not to mention a bowling alley and a number of other recreations. Visiting a city with as many culinary and niche brewpub options in Portland can be daunting, but hopefully for the casual traveler, this list serves as a quick means by which to dip your toe in what Portlandia has to offer.